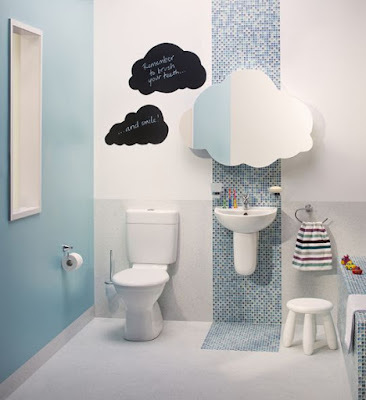 If you have a place at home and you want to create a special bathroom design for kids to love to bathe and brush their teeth, we bring you kids bathroom ideas to decorate! Do not miss the images. 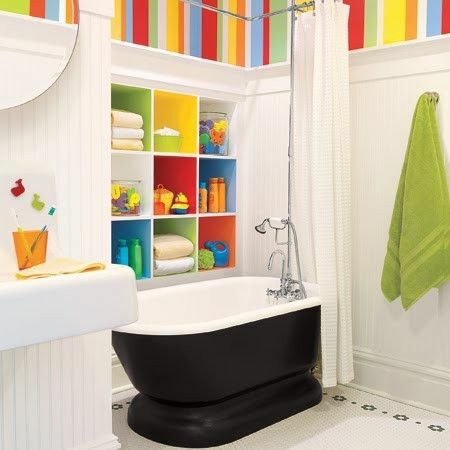 The bright and striking colors cannot be missed in kids bathrooms. 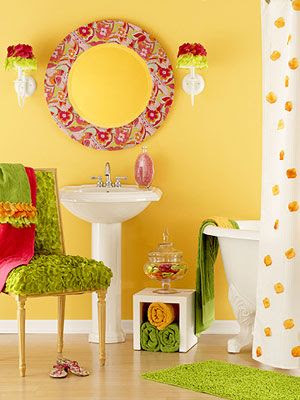 The idea is to create a combination of colors that will add a fun touch to the room. 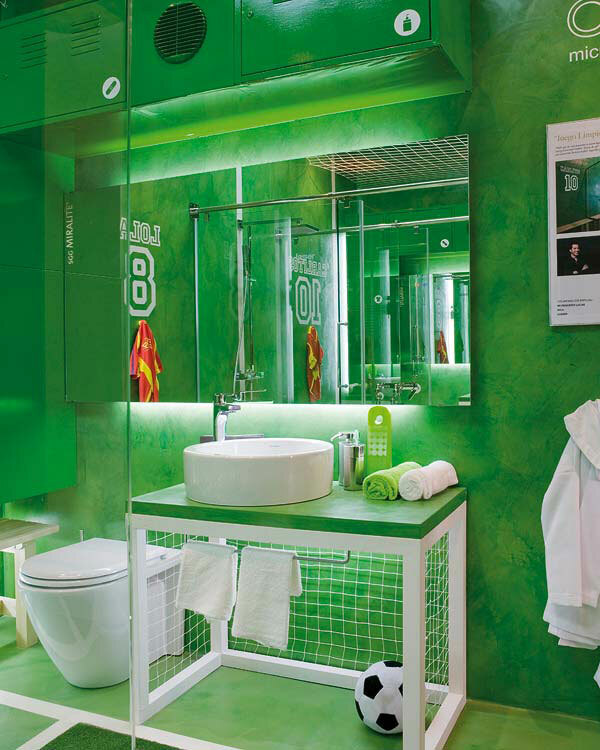 For this, intense colors such as greens, oranges, reds, blues, and fuchsias are convenient among others. 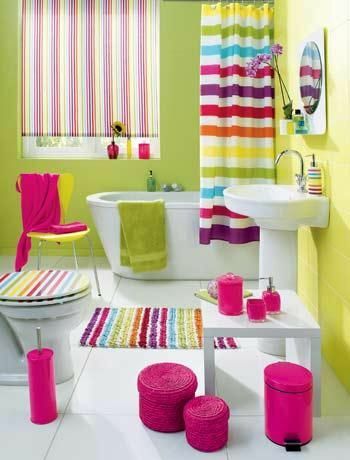 An alternative is to choose a neutral and luminous base color for the walls and combine it with colorful kids bathroom furniture and accessories or opt for two bright colors that contrast well. 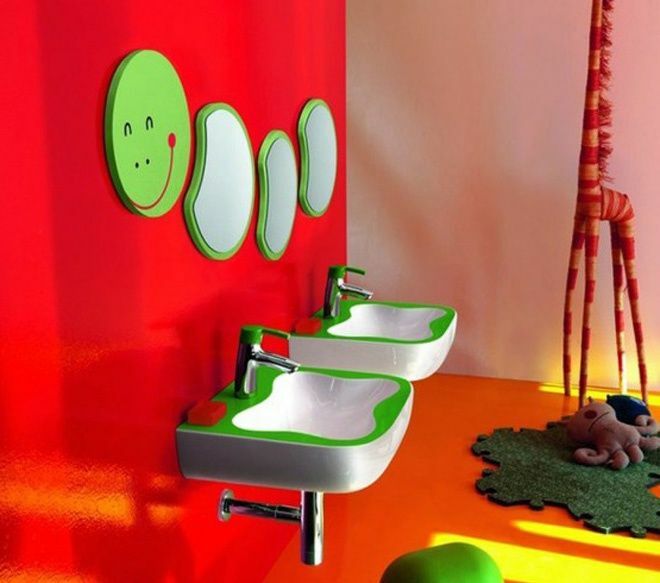 Colors such as oranges, reds, blues, greens, and yellows are ideal to bring life and originality to the kid's bathroom decor. 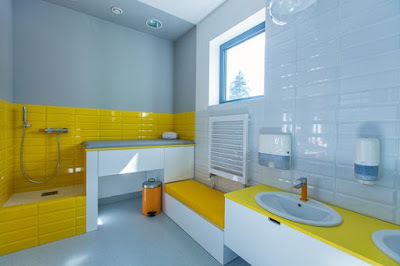 Combining the white walls with tiles of different colors can also give a very cheerful appearance to space, in addition, it is a good option to make cleaning the bathroom easier. When choosing the kids bathroom decor you can always resort to a theme that is liked by the kids and serves as the basis for decorating the rest of the space. Cartoon characters, animals, sports hobbies ... and everything that they like best so that they feel comfortable in their room. Using vinyl stickers and kids bathroom curtains related to the theme chosen for decoration is a great idea that will attract the attention of children. 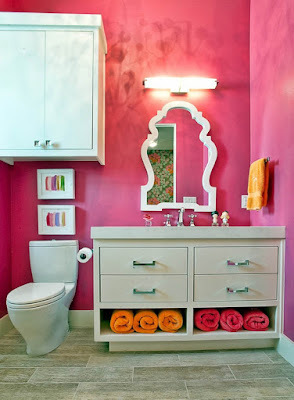 You will find vinyl of all kinds and shapes that are very easy to paste on walls, tiles, and furniture. 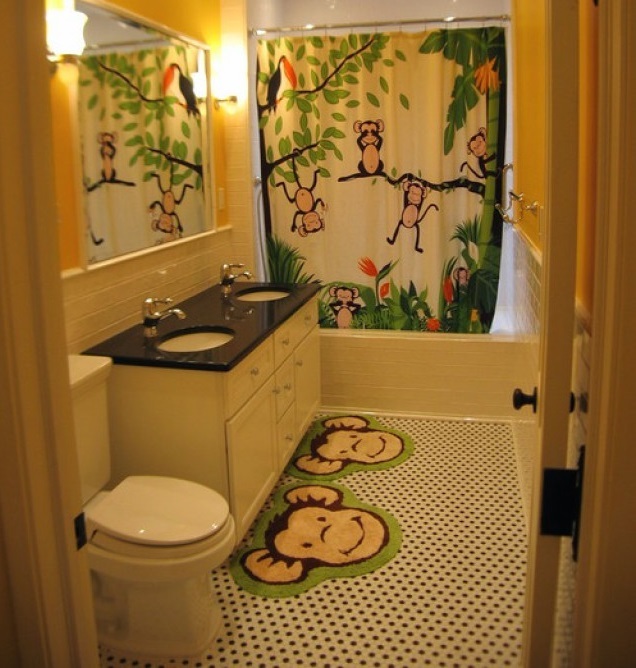 What do you think to recreate the jungle in the kid's bath decor? I love the idea, especially because in this bathroom there is enough room for two little brothers to wash their teeth in unison. Nice and practical! Without a doubt, this is one of the kid's bathroom decor ideas that I like the most. It left me with my mouth open. I imagine my little one in that bathroom! I would never want to leave there, he would spend hours kicking the ball! Kids love to get dirty and there is no problem if the crafts come with extra paint or the garden is full of puddles and mud at the end the fun is always guaranteed! What can become a whole odyssey is to put them in the bathtub and get that moment does not involve a drama or reach all their things (toothbrush, towels) without height problems. 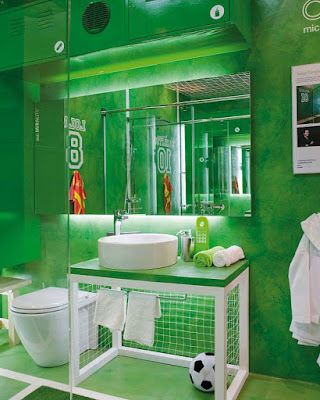 With small tricks and a little imagination you can get the bathroom is perfectly equipped for them and their needs. 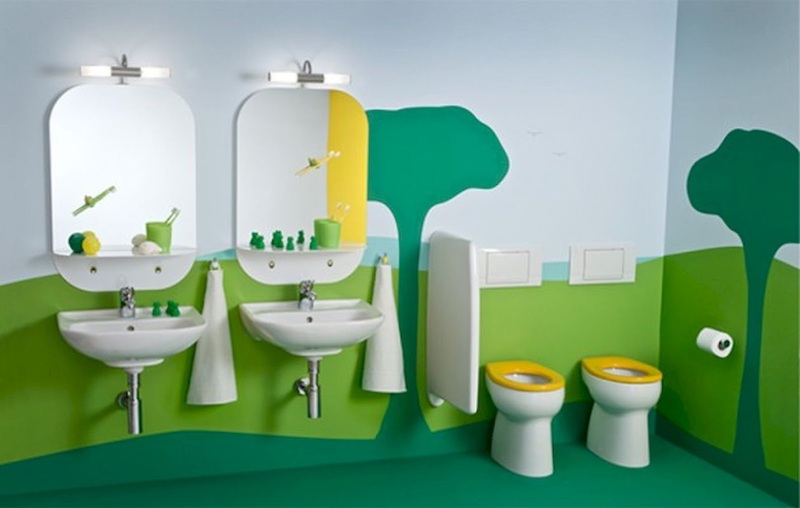 And, is that building a comfortable space for children is essential so that their personal hygiene routines are also part of the game and so that the fun never lacks! 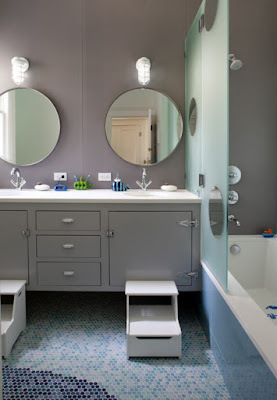 How to choose a changing table for kids bathroom decor! A changer gets the adventure of changing the diaper or changing clothes becomes a much easier task for parents. If you opt for an inflatable model you will get a flexible and easy to transport changer that will allow you to place it anywhere just by inflating its four sides. Combined with a cabinet loaded with drawers and shelves you will get all the products, clothes, diapers and baby towels are on hand without losing attention to them. A changing table offers a practical change system that allows you to always keep a hand on the baby and have everything under control. 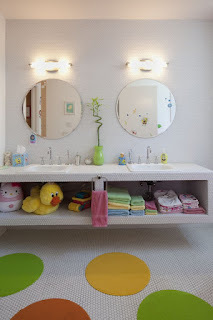 The time to bathe, get up and relax are daily routines with which children also have to live and learn to be punctual. Making it easier is as simple as installing auxiliary furniture and storage solutions suitable for them. 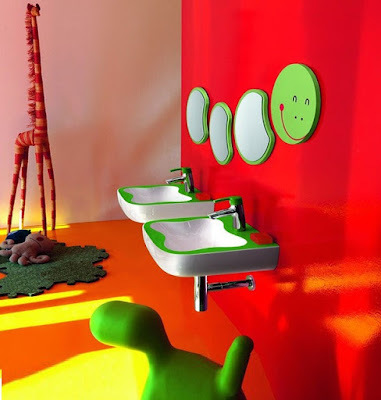 An auxiliary step: If you incorporate a comfortable step in front of the sink you will get the little ones to be able to wash their teeth, face, and hands more easily. Also, avoid puddles and they can develop this task alone and to perfection! Low height towel racks: The original clothes racks help everything to decorate the kid's bath. Thanks to its self-adhesive you will be able to move them as the children grow and make towels and toiletries in their right height and without a single hole! 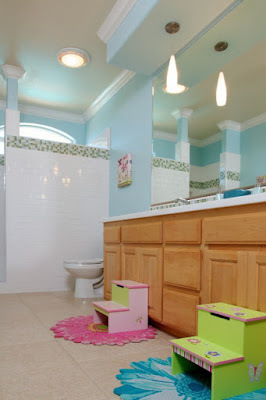 Hooded kids towels for the bathroom: The towels are also kid 's play! Choose one of cotton, which is soft and pleasant to his skin. If he also comes with a hood and sleeves, it will be much easier for him to dry himself and will act as a bathrobe! Urinal to learn: The best compliment so that, little by little, get used to going alone to the bathroom is a potty to suit you. Opt for a model that has the back in anti-slip material, so that it does not slip when he uses it and above all, it is easy to empty and clean! 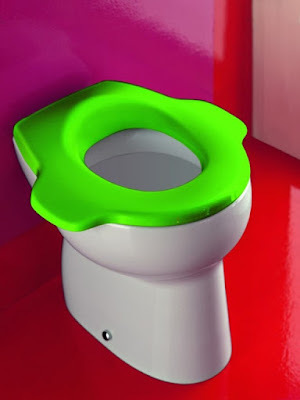 Adaptable seat for toilet: If your space in the bathroom is small and you do not have a space in which to place a potty for the children you can get a toilet seat adapted to the measures and needs of the kid. They are easy to store and clean, and can be supported on the wall or hung when not in use. 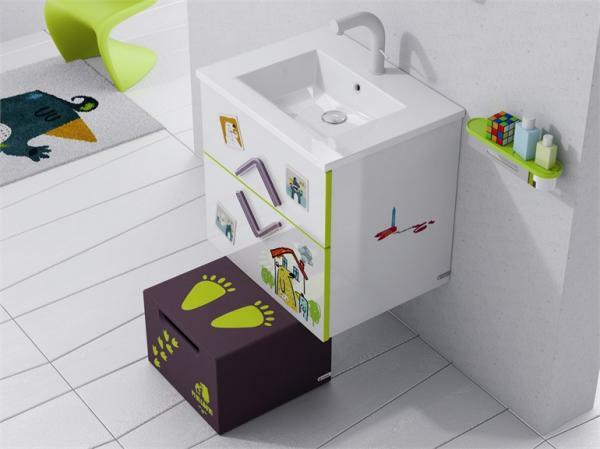 Portable kids bath: The portable bathtubs help us in the difficult task of bathing the kid between splashes and they do not take up too much space! We can place it in the shower or in the bathtub of the elderly and let the bathroom become a relaxing moment where temperature and atmosphere are always under control. After the shower, we can hang it on the wall to save common space as if nothing had happened! Custom hand towels: Children need hand towels to his low height, Think your hands and face are not like yours! You can hang them next to the sink with a suction hook and they will always be within reach and they will be able to handle them comfortably.